The Skinner Howard gallery’s decision to begin exhibiting shows for two months rather than one couldn’t have come at a better time; now visitors will have a whole extra month to check out the excellent show of paintings from UC Davis grad student Mathew Zefeldt. The show, An Alternate Fantastic Reality, is comprised of nine large acrylic paintings which almost overfill the gallery space. The title suits the content of the work: vaguely surrealist imagery heavily laced with references from comic book art. And that language is specific: comic book art, not just cartooning. The paintings include Marvel Comics-type speech balloons, Jack Kirby-inspired linework and even a ‘guest appearance’ by Iron Man. Zefeldt’s jumbled layers of line and illustration are reminiscent of both the overprint from cheap newsprint and old graffiti buried under years of subsequent tagging. Though the description above might seem to imply that the show would echo the work of Roy Lichtenstein, Zefeldt has deftly sidestepped that art-historical landmine. Instead, the paintings have a distinctly contemporary look, with strong elements of both street art and postmodernism. The tonal qualities of the work also help lessen any association with Pop Art; most of the work in the show tends toward a muted palette, with grey being the most common color – worlds away from the primary colors associated with Lichtenstein et al. Zefeldt does employ very vivid colors in his most recent paintings, but the effect is still much more like Chris Johanson or Jay Howell than Lichtenstein. If Zefeldt’s muted color schemes are unlike Lichtenstein, they are reminiscent of another midcentury painting icon, Phil Guston. Zefeldt’s most recent work often features a huge, roughly-rendered, blobby pile of goo, and appears to owe a significant nod to that artist’s sixties and seventies work. Sure enough, a visit to Zefeldt’s Davis studio revealed a Guston monograph in the short stack of books next to his drawing table – right under a decade-old issue of Spawn. The studio itself is jammed with work (and a five foot tall sculpture of the aforementioned pile of goo). 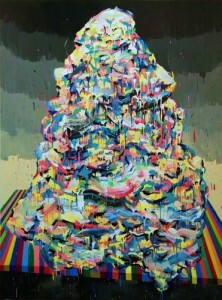 All of the work in An Alternate Fantastic Reality was completed during Zefeldt’s tenure at Davis and there is a clear transition from the earlier work, which is more rooted in comic book imagery, to the artist’s newer work, which seems to be strongly influenced by the art historical canon. 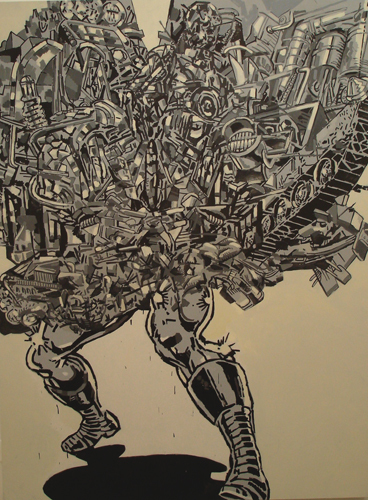 Zefeldt’s comic-influenced work, exemplified by How I Learned to Be a Machine, is low on color and is densely layered with a cluster of linework, out of which emerges familiar imagery from classic superhero comics including military vehicles, electronic gadgetry and the Marvel Comics character, Iron Man. A Space Between Fiction and Non-Fiction epitomizes the later work: a much more ambitious use of color, a more ‘painterly’ handling of materials, and imagery that owes more to Guston than to Kirby. While the brushwork and vibrant color of the newer work has an undeniable energy, there is a freshness to the earlier paintings that kept bringing me back to examine them again. All but two of the paintings in the show are from this year, and it is clear that Zefeldt puts in a lot of time at the easel. If one couldn’t guess that from the sheer amount of finished canvases stacked in the artist’s studio, it would still be clear from examining the paintings themselves – Zefeldt’s art has an exciting sense of exploration that only exists in the work of artists who make work constantly, and then use their own archive as a main inspiration. One can almost watch Zefeldt’s thought processes play themselves out in each successive canvas. It will be interesting to see where those thought processes lead over the next 60 or so years. Zefeldt is young; at 23, he has only begun his career. And he’s lucky – very few painters make work as assured and mature as the paintings in An Alternate Fantastic Reality so early in their lives. We’re lucky as well. Lucky that Zefeldt chose UC Davis to further his studies, lucky that we have that incredible source of ideas and artistic energy just down the road, and lucky that Pamela Skinner and Gwenna Howard gave Zefeldt the opportunity to haul his show-stopping body of work across the causeway – one more talented Aggie showing up on our doorstep.